I've been meaning to go to Sakana Tei for what seems like aeons. I'd read good things about it on a blog called Food for Stomach, which I'd followed avidly until one day it was made private - "for invited readers only". I was too embarrassed to ask for access, but I never forgot the vivid pictures and descriptions, so when I found myself on Regent Street, I made a beeline for Sakana Tei. Japanese clientele, check. Itamae at the bar, check. That intense smell of dashi, pickles and fried goodness that brings a natsukashii tear to my eyes, check. As soon as I sat down, a cup of complementary green tea appeared. 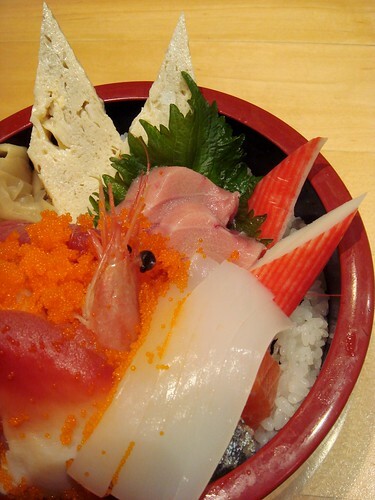 I browsed the set lunch menu and, though tempted by the lot, I went for the chirashi teishoku as it came with dobin mushi which I can never get enough of. 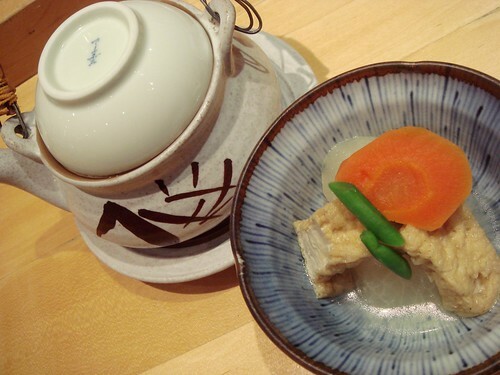 The appetiser was a nimono dish of squishy fried tofu, daikon, carrot and green beans, lightly simmered in stock. Sweet, light and juicy, this was a refreshing, well-judged start. The dobin mushi was equally delicious. 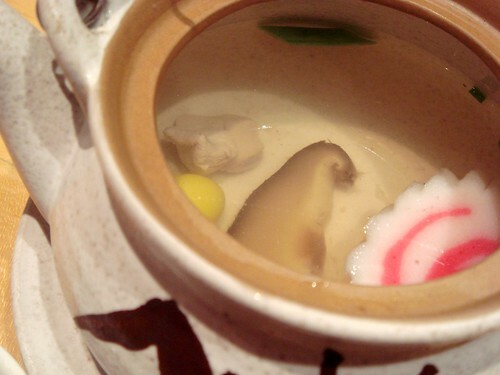 A teapotful of consomme packed with flavour and bits of goodness to fish out like naruto fishcake, ginko nut and shimeji mushroom. I dearly missed having a wedge of lime to squeeze over the top though. First course done, I eagerly awaited my chirashizushi whilst fiddling with the nanami togarashi and sansho pepper pots in front of me. Occasionally I'd perk up as I recognised the odd word in Japanese. I'm trying to learn but it's going quite slowly - pretty much all I can decipher is food terms and numbers. 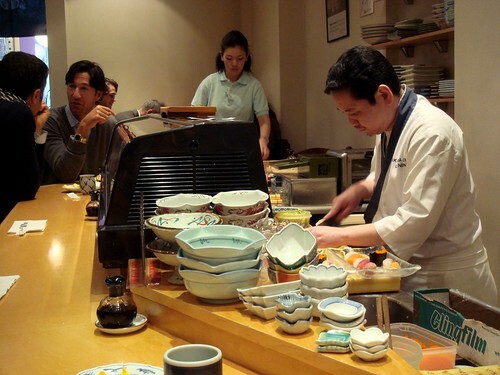 I didn't really mind waiting as I could watch the itamae at work, but every time a dish of gem-like morsels flashed past me to another punter, little pangs of disappointment stabbed me. After about twenty minutes, it was finally my turn and boy, was it a sight for sore eyes. I counted at least 12 different types of sashimi including salmon, octopus, squid, ebi, tobiko, some medium fatty tuna, mackerel. 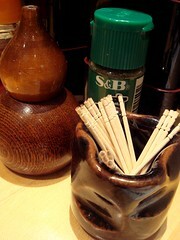 There were also lashings of gari (sushi ginger), shiso (perilla leaf) and some tamago roll and even crabstick for luck. The fish was all sparklingly fresh and disappeared in moments. The omelette was less sugary sweet than usual and provided nice contrast. The only disappointment was the octopus which was jaw-achingly rubbery. The sushi rice was pleasingly tangy, but there was just too much of it and I worried that I'd be struck down for leaving so much (it's offensive to leave even a grain of rice). As I ate, the grey-haired Japanese gentleman who had greeted me upon entry came up to me and apologised profusely for the wait. This unnerved me a little - I wondered if he was merely being polite or thought that solo diner me was a restaurant critic (imagine). Anyway, I finished my meal and I went up to pay said gentleman at the front desk. He looked at me warmly and suddenly stuck out his hand and squeezed me gently on the arm, saying "I really am very sorry. I hope you come back". Somehow this didn't feel like an invasion of personal space - in fact I felt a foolish grin suffusing my entire face which stayed as I walked out the door. That's natsukashii for you. I miss Japan. The chirashi looks great meemalee! @gourmet traveller - Your posts made dinner look incredible! I am going back and I'm going to try to get Fumio-san to adopt me too. @Dennis K - It really was! Ooo- yum. I want tempura. And I want to visit Japan. @TheFastestIndian - My in-laws are currently stranded in Tokyo thanks to volcanic ash! Now really-really-really hungry... and wanting sashimi for lunch. That is a very fine looking chirashizushi. Is it an expensive place for lunch? @The Grubworm - Not too bad - this was less than £20 with the two starters. You can get a one dish meal eg donburi, for a tenner. 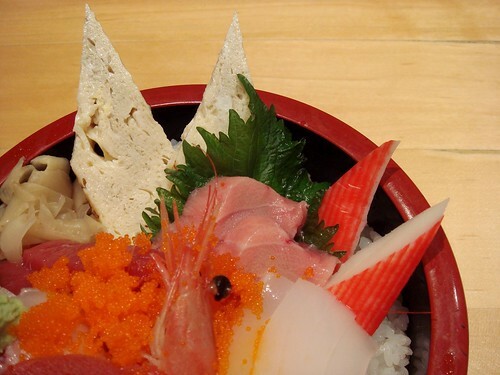 Hi Meemalee - I agree with Dennis - that is a lovaely Chirashi. Hi Meemalee, thanks for your insider tips, I would recommend a trip to Paris to the rue st Anne in the 2e to sample some authentic Japanese cuisine. restaurants 'you' and 'chez Miki' are amongst my favourites. 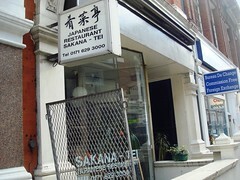 I have moved to London and miss my lunchtime chirashi but no longer with Sakana Tei.